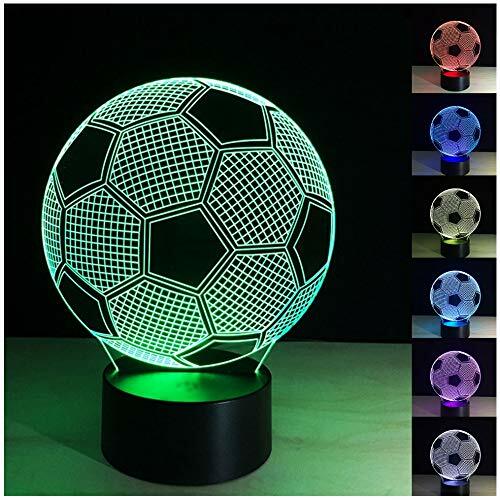 7 color LED changing mode: Red, Green, Blue, Yellow, Cyan, Pink, White, Color changing. Press button: Press one time, one color light up, press it again, another color light up. Press the touch button to last color, then press it again, auto color changing mode works. US, UK, EU , AU adapters available. PMMA acrylic is not glass,the whole board is solid acrylic material.Strong, hard, high toughness, not fragile, will not hurt the child. Very low heat-conductive, will not be hot after long time working,Soft warm light, will not hurt eyes. It can be put in bedroom, child room, living room, bar, shop, cafe, restaurant etc. The lamp is Flat Unique Lighting Effects Amazing Optical Visual Illusion Home Décor Lamp. Do not touch the acrylic plate surface with your fingers to avoid finger print marks on the plate which may affect the 3D illusion. Kindly Reminder: Please tear out the acrylic panel surface protective film before using.  3D VISION EFFECT 7 COLOR CHANGING NIGHT LIGHT- especially in the dark or take a photograph, the vision thrill will be strong! Package included:1x 3D illusion lamp (Acrylic panel + ABS Base),1X USB cable ,1X English Menu. The lamp is flat,some model Acrylic board sided with a protective film, please put the protective film be removed before use.  3D DECORATIVE LIGHTS EASY TO USE,1 BUTTON color change - by which the light can toggle between 7 kinds of monochrom color mode and 1 flashing color mode,it means you can have a DIFFERENT color for each day of the week.  COOL GIFT & GOOD DECORATIONS FOR YOUR SPACE- your kids or friends will love this cool gift, and it is also a perfect decoration for your bedroom or baby room or cafes or clubs or restaurant etc. If you have any questions about this product by Etzon Technologies, contact us by completing and submitting the form below. If you are looking for a specif part number, please include it with your message.